Sydney, Oct 22, 2013 (Global Fashion Wire) - The new styles from the Rock Out Diamond collection are classic designs, highlighted by a genuine diamond marker at 12 o'clock. 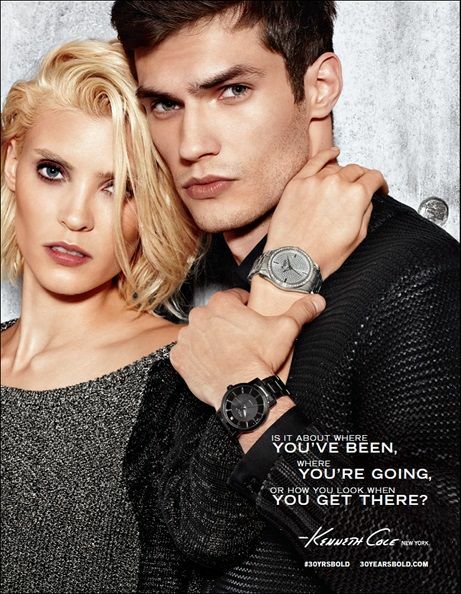 The men's collection features sleek styling, luxurious leather straps, and sophisticated dress bracelets, while the women's collection features beautiful shades of silver, yellow, and rose gold, accented with diamonds and pyramid studs. Both styles offer a refined, sophisticated twist on a classic timepiece. To bring glamour to the holiday season, Kenneth Cole introduces a new women's series, which features sparkling crystal accents and luxurious finishes, allowing you to "Own the Night." The collection is highlighted by a feminine transparency collection which features elegant crystals floating around the dial, a jewellery inspired petite square, and an oversized ladies pave dial and crystal bezel. Kenneth Cole Productions, Inc. designs, sources, and markets a broad range of footwear, handbags, apparel, and accessories under the brand names Kenneth Cole Collection, Kenneth Cole New York, Kenneth Cole Reaction, and Unlisted, as well as footwear under the proprietary trademark Gentle Souls. The Company has also granted a wide variety of third-party licenses for the production of men's, women's, and children's apparel as well as fragrances, watches, jewellery, eyewear, and several other accessory categories. The Company's products are distributed through department stores, better specialty stores, company-owned retail stores, and its e-commerce website. Further information can be found at kennethcole.com. GDL accessories is the Australian partner for both the Geneva watch group and the Movado Group, boasting a portfolio of luxury fashion watch brands including, Hugo Boss, Scuderia Ferrari, Tommy Hilfiger, Kenneth Cole, Lacoste, Ted Baker, Juicy Couture and more. Media and creative arrangements are handled in-house. Proposals or requests for more information including Hi Res images can be sent to melinda@gdlaccessories.com.